Petrified wood is a staple of southwestern North Dakota and is a geologic wonder in itself. It’s the fossilized remains of ancient trees that were trapped underground or underwater, without any oxygen. Minerals are deposited into the tree’s cells, and over time, turns the wood to stone. The original structure of the tree is preserved, down to the microscopic details. Petrified wood is very common in the rocky butte country of western ND, and is a reminder that this area of the great plains was once covered in trees that were later buried under a shallow sea, millions of years ago. 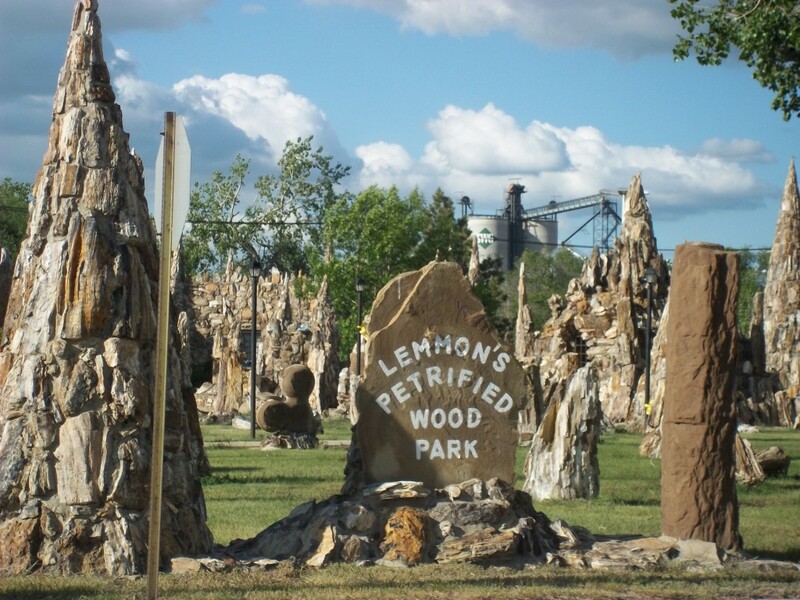 Lemmon, SD sits on the border of North and South Dakota in the western part of the state. It’s a small town of about 1,200 people not really all that close to any major cities. 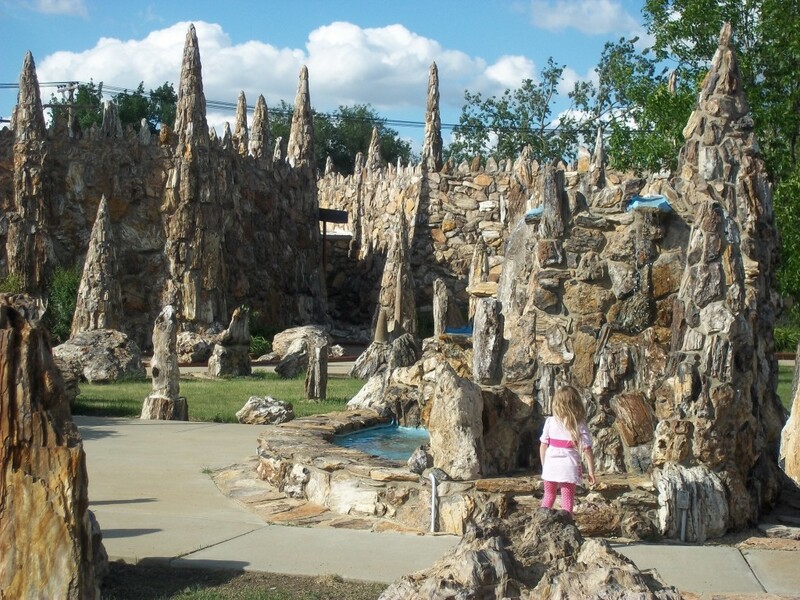 It also is home to the incredible Petrified Wood Park and Museum, the largest in the world. 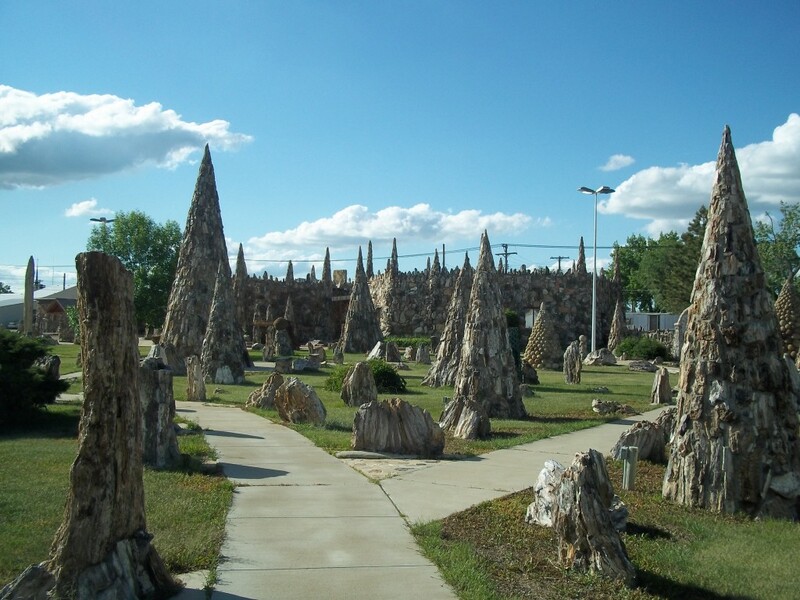 The park occupies an entire city block and contains hundreds of petrified wood spires, towers, structures, and countless other formations. The park was built in the 1930’s by a crew headed up by Ole S. Quammen, and was donated to the city in the 1950’s. There are also two museums on the site (made of petrified rock of course) that detail the history of the park and the town, including artifacts from the area. Unfortunately these were closed for the day by the time we got there. Admission is completely free and there is a lot to see here. 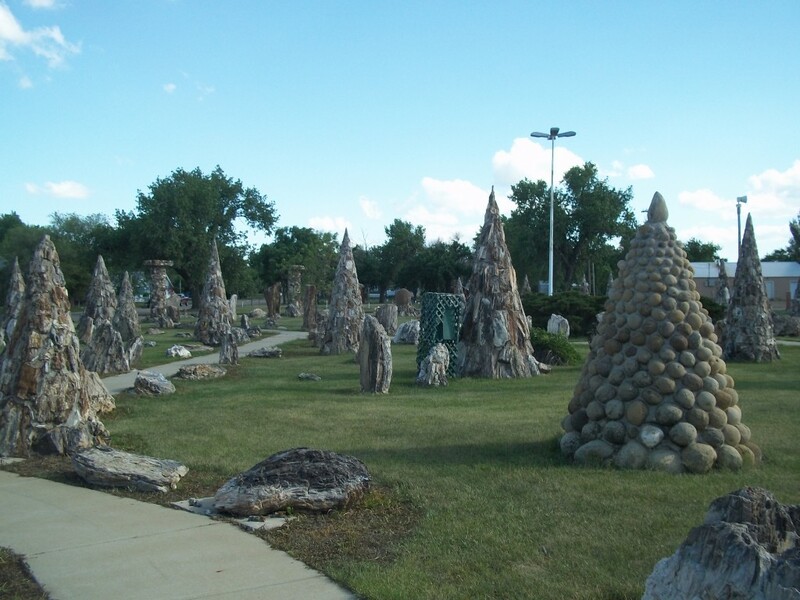 There are cannonball towers (cannonballs are spherical rocks, also known as “concretions” formed by compacted sand that look similar to cannon balls), as well as fountains, a grotto, dinosaur clawed stones, and all sorts of other rock sculptures. It’s a geologist’s mecca. This is one tourist attraction that is definitely worth going out of the way for. 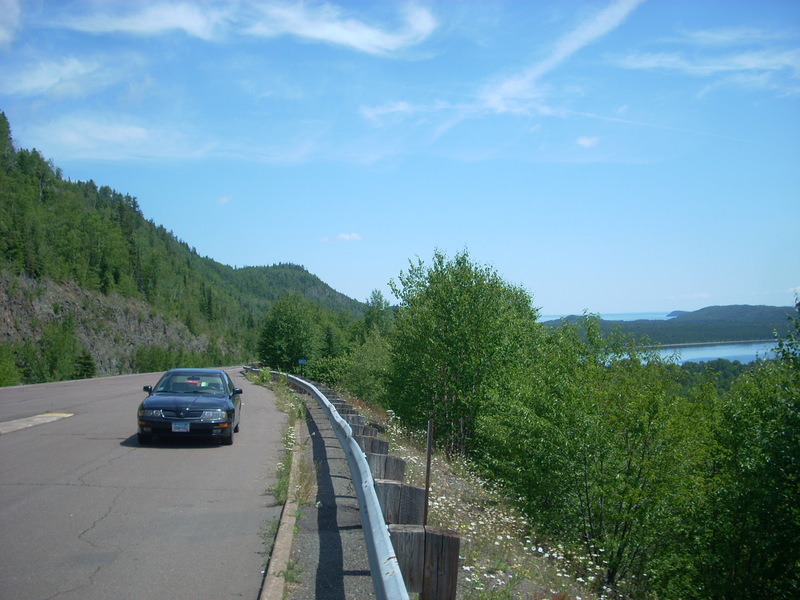 Although Lemmon is a bit off the beaten path, US Highway 12 does go through it. The area is beautiful around here, flush with mountainous buttes, sweeping vistas, and wide open expanses of high-plains country. While in the area: Check out The Grand River Museum is located on Highway 12. The Museum features exhibits on dinosaurs, Native Americans, cowboys and ranch life, a full-scale tipi and a sweet scrap-metal sculpture of a cowboy riding a triceratops. This entry was posted in Highway Highlights and tagged Lemmon, Roadside Attraction, SD by Seth5544. Bookmark the permalink. I’ve been to this geological wonder!! Loved it!! Totally captivating. I’ve also got some of those cannonballs in my yard! Out-of-town visitors can expect the Petrified Wood Park & Museum to be ground zero for “THE MESSAGE” starting on 31 July 2015. People will witness a supernatural event beyond expectations from that location.